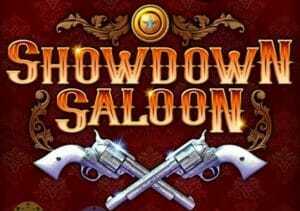 Another video slot from Microgaming to feature the Mystery Stacks game engine is Showdown Saloon. It’s a 5 reel, 15 payline, Wild West-themed game that also comes with re-spins and a bonus round that awards up to 15 free spins. Play on your PC, tablet or mobile from between 20p and £100 per spin. The visuals in Showdown Saloon are simply done. On the reels you’ll see lower value royal values alongside bottles of whisky, dice, poker chips and pistols. Helping things along is the royal flush poker hand which is the game’s wild and substitutes for everything bar the free spins scatter. The Mystery Stacks are central to the action here. Large stacks of symbols are replaced by the same matching symbol on each spin to create potentially large winning combinations. Hope to see full stacks of matching symbols land on adjacent reels as they can trigger a re-spin. During the re-spins, the stacks from the triggering spin are held. Any Mystery Stacks that land on a re-spin transform into the same symbol from the triggering spin. Land a matching stack next to the cluster and you’ll get another re-spin. The sharp-shooting cowboy is the free spins symbol. Land 3, 4 or 5 stacks of these on the same spin and you’ll pocket an award of 1, 2 or 3 times your total stake. You’ll also trigger the Free Spins feature and with it, 5, 10 or 15 free spins. During those free spins, any Mystery Stacks that land will match. You can also land the re-spins during the free games round. The Mystery Stacks feature is a little unusual so we suggest a few games in play mode. Once you have got accustomed to the slightly unusual features, then there’s plenty to like here. The design might not be the sharpest you’ll see but it’s clear enough. The gameplay offers a nice variety too, especially if you like high variance. The western-themed video slot remains surprisingly popular and this is a perfectly solid addition. If you like volatile action and streaky features, then a visit to the Showdown Saloon is recommended. I suggest you try NextGen Gaming’s The Wild 3 which is much better and offers payouts of up to 25,020 times your bet on every spin!